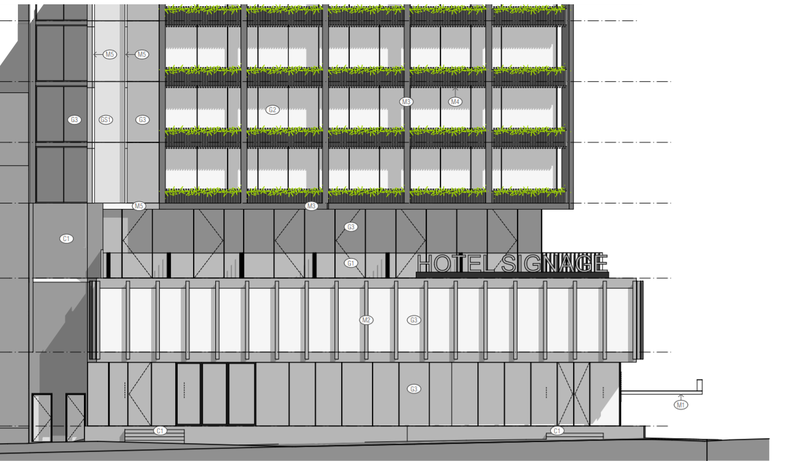 The City of Melbourne - via its Future (Planning) Committee - has thrown its support behind a development proposal at 407-415 King Street in West Melbourne, albeit with a caveat attached to it by way of a reduction in height. DCF Property's latest development proposal for a 19-storey tower on the current site of Flagstaff House, would include the internal demolition of the two-storey building which is covered by a heritage overlay. Completed in 1968, Flagstaff House was designed by Yuncken Freeman with the individual heritage overlay (HO842) pertaining to the exterior only. The approval paves the way for the construction of a 60m building accommodating 258 hotel rooms, two function spaces on the roof level and a 177 sqm restaurant located on the ground floor. The Fender Katsalidis-designed scheme replaces a previous application which was refused at VCAT in April 2017. First submitted in May 2016, the initial proposal designed by Plus Architecture, sought approval for a 69m high mixed-use tower featuring apartments and hotel rooms. According to the City of Melbourne, 'had a failure appeal not been lodged, the application would have been refused due to significant concerns relating to heritage, built form and design matters'. One of the key considerations VCAT cited in its verdict, was that any redevelopment of Flagstaff House must provide an appropriate design response and built form outcome. The new proposal seeks a reduced scope of demolition works than previously proposed, with the intent to retain the buttress elements and other notable features determined by VCAT. The proposed tower is expressed as a single form, rising above and beyond Flagstaff House. The introduction of setbacks and a more proportionally appealing massing, allows Flagstaff House to 'read as a strong element therefore allowing for the real appreciation of it’s form', says the planning officer report. Additionally, the design and materials proposed are considered 'respectful' and complement Flagstaff House's Modernist architecture. with and a complement to the heritage host. the host and so to a degree as secondary to the host. Whilst a smaller building, it is my expectation that the original building will retain a primacy of presence given the responsive composition of the new, which follows directly from that of the heritage host. FK are proposing a material palette which comprises clear and feature glazing, a combination of black steel paint and anodised finishes based on the existing heritage elements. A bronze metal canopy will provide a flourish of colour to the streetscape. The City of Melbourne's Urban Design team also expressed their support for the amended design noting the additional ‘bay’ to the upper floor facades and the removal of service louvres to King and Batman Street have resulted in an improved outcome which satisfies previous feedback provided. Interestingly, the Urban Design team didn't express any concern regarding the proposed height. Despite its general support, the City of Melbourne is seeking a reduction in height down to 53m (excluding the lift overrun) or the equivalent of two-storeys. According to planning officers, the 53m height will also ensure that 'the proposed tower steps down from the adjoining (development at Flagstaff Green) which is at a height of approximately 66m'.